Streetsblog reader Anna Weaver alerted me to an interesting new pavement marking treatment on Chestnut Street between the Hancock Tower and Water Tower Place. While the block previously had no lane markings, making it a de-facto three-lane westbound street, the city recently striped a median that serves as a bit of a road diet, transforming it to a two-lane thoroughfare. Hopefully, this is calming traffic somewhat. That’s not to say that the block is currently a pedestrian paradise. There’s a busy mid-block crosswalk between the two tourist attractions. 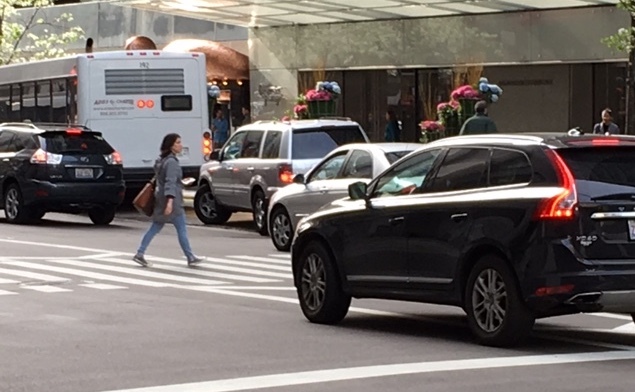 Judging from numerous photos Anna sent, people on foot still have to navigate a snarl of traffic, and driver’s aren’t always obeying the state law by yielding to people in the crosswalk. There are a couple of yellow diamond “Pedestrians Ahead” signs at the next intersection east, at Mies Van Der Rohe Way. But, as Anna pointed out, the caution sign on the south side of Chestnut is obscured by a light pole and “One-Way” sign. 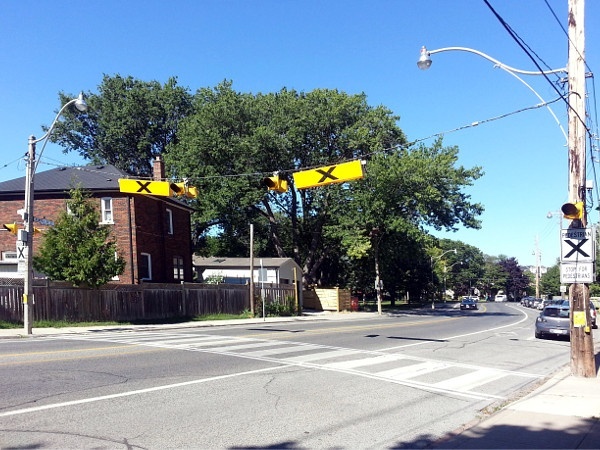 The two signs are also located half a block away from the mid-block crossing, perhaps too far away to give a timely warning. 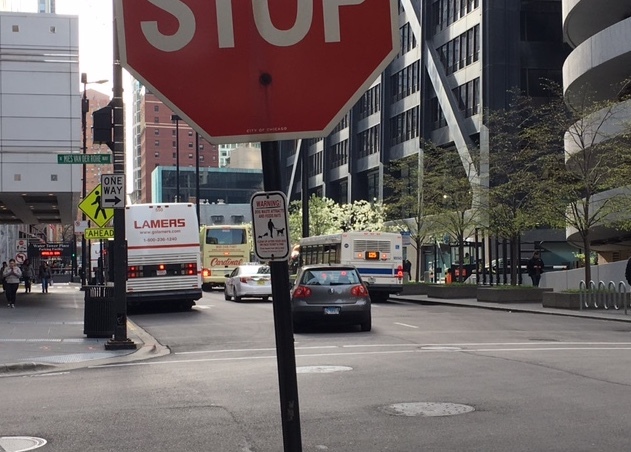 What the mid-block crossing is really crying out for is a “State Law: Stop for Pedestrians Within Crosswalk” sign. 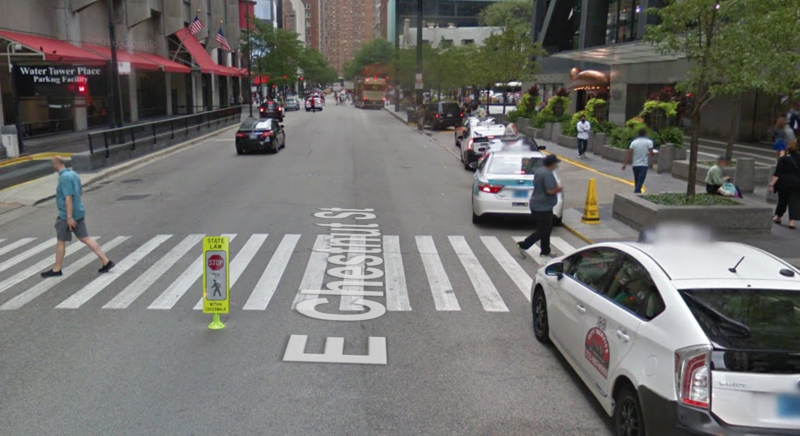 As you can see from this August 2016 Google Street View, it used to have one installed in the middle of the street, right before the crosswalk. However, Anna says multiple “Stop for Pedestrians” were installed at this location, destroyed by drivers, and then obliterated again. She says it seemed to be the only such sign in the 42nd Ward. Since the sign hasn’t been reinstalled along with the new striping, perhaps the city has given up on in-stalling in-road signs at this location. A good alternative might be to install signs on poles on the sidewalk, where they’d be relatively safe from getting run over. It would probably be a non starter to install signs that would actually cause some real property damage if hit such as heavy concrete bases. It’s the Hancock Center, not tower. Yeah, and it’s the Willis Tower, Macy’s on State Street, and U. S. Cellular Field, right? Whoops, that’s Guaranteed Rate Field. It’s hard to keep track of who owns the naming rights. Next thing you know, they’re going to be naming the Cubs’ ballpark after a chewing gum company! Huh? I think you’re trying to sass me but it’s falling flat. Despite my preference, it is the Willis Tower and Macy’s on State Street. That wasn’t a “when I was young it was called X so it should always be called X” comment. It was a “the official name of the building, not to mention its colloquial name, is the Hancock Center” comment. A correction, not a critique. My point is, like the Sears Tower and Comiskey or Sox Park, the Hancock Tower may not be the building’s official name, but that’s what Chicagoans actually call it. They don’t though. As said above, the official and colloquial name is Hancock Center. And for that matter, even though some people still call the Willis Tower the Sears Tower, you wouldn’t write a headline in 2017 that says “Sears Tower adds bike parking” would you? No, the official name is the Hancock Center but the colloquial name is the Hancock Tower. “You wouldn’t write a headline in 2017 that says ‘Sears Tower adds bike parking’ would you? Actually, I would. I generally reject the notion that residents should stop referring to a landmark by the name they’ve been using for decades, simply because the naming rights are sold to the highest bidder. For similar reasons, you’ll notice that on Streetsblog Chicago we usually call the trail and park system The Bloomingdale Trail, rather than its official name, The 606. Grassroots advocates had been calling the project the Bloomingdale Trail for years when the city announced that they were changing the name for marketing reasons, with almost zero prior notice given to key advocates. In summary, there’s nothing wrong with calling the building by its official name, the Hancock Center, but I prefer to use its popular name, the Hancock Tower. Turn around and ask the person closest to you what the big building with the Xs is. They won’t say the Handcock Tower. Just because you learned the wrong name for the building when you moved here, doesn’t meant that’s what everyone says. FWIW, I just did an informal survey on Facebook. 30+ people responded with a bunch of different variations and nicknames, including a few “Hancock Tower” proponents, but the only person who said “Hancock Center” was the editor of the local architecture news site Curbed Chicago. It's a nice project, but why do cyclists get a speed hump while motorists don't? The Chicago Department of Transportation recently installed new buffered bike lanes on a 0.75-mile stretch of Harrison between Halsted and Loomis next to UIC and Little Italy as part of a water main project.